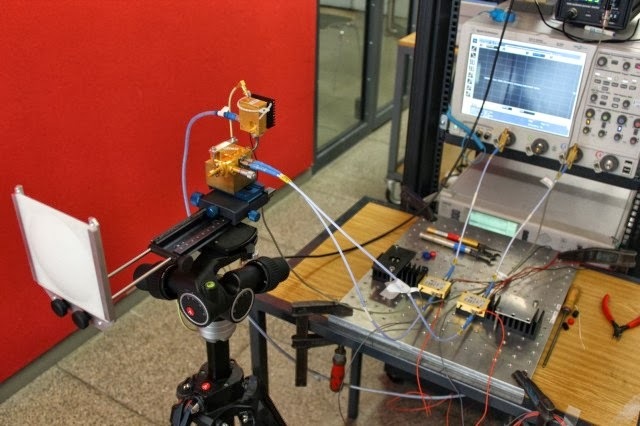 German researchers have combined photonics and electronics to create a world-record-breaking wireless network that can send and receive data at a heady 100 gigabits per second (Gbps). This beats the same team’s previous world record of 40Gbps. At 100Gbps, or a transfer rate of 12.5 gigabytes per second — ten times faster than Google Fiber — you could copy a complete Blu-ray disc in a couple of seconds. 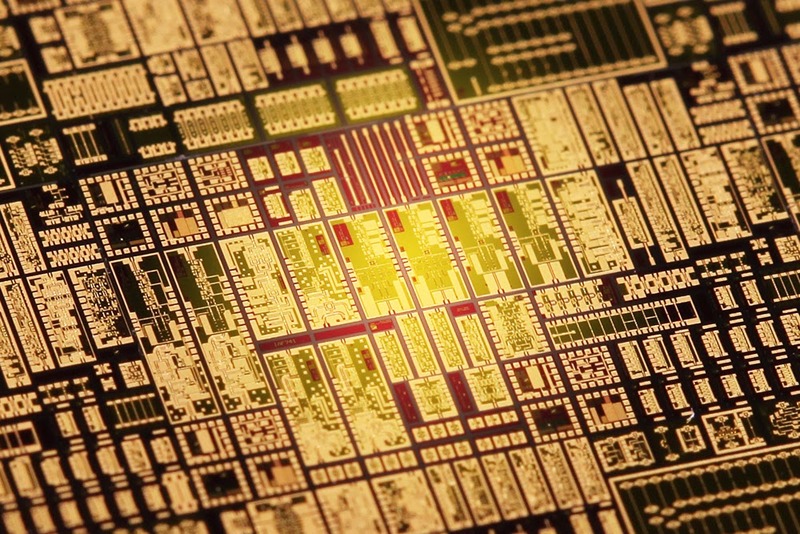 To achieve such a massive data rate, researchers from the Karlsruhe Institute of Technology (KIT) used a massive swath of bandwidth at around 240 GHz — close to the terahertz frequency range. To create the signal, two laser beams (carrying the data) are mixed together (using a photon mixer made by NTT Electronics). An electrical signal results, where the frequency of the signal (237.5 GHz in this case) is the difference between the two optical signals. A normal antenna is then used to beam the signal to the receiver, where a fancy chip fabricated out of fast-switching III-V transistors (pictured below) is required to make sense of the super-high-frequency signal. KIT’s 100Gbps wireless network is exciting for two reasons. The first is the most obvious: Yay, faster download speeds! Second, because the wireless signal is generated by a laser signal, it’s an ideal technology to tack on the end of a fiber network. For example, if you have high-speed fiber coming into a telephone exchange or mobile base station, you could then use KIT’s wireless tech to cover the last mile to your home. So far, KIT has only created a 100Gbps network over a distance of 20 meters in the lab — but last year’s 40Gbps world record was set using similar hardware over a range of one kilometer, across the rooftops of the city of Karlsruhe, Germany. Perhaps most importantly, though, KIT transmitted 100Gbps using a single data stream. In the case of conventional WiFi, a single connection — between your router and laptop, for example — in reality consists of dozens of data streams, which are squeezed over the same channel with clever techniques such as multiplexing and MIMO (multiple antennae). These same techniques could be used on KIT’s 100Gbps data streams, boosting total link speed to terabits per second — or entire Blu-ray movies in just a fraction of a second. Both the 40Gbps and 100Gbps world record were part of the Millilink project, a project funded by the German government to bring broadband internet connections to rural and under-connected areas. The project’s entire budget was just two million euros ($2.7 million). It makes you wonder what could be done to the abysmal state of rural internet access in the US and elsewhere if we actually invested some money into it.